Rachel and Kim were in the kitchen when they heard horrible screams coming from the darkness outside. Jen asked me to mute the TV. Everyone was quiet. I listened from the living room until I heard it: a high-pitched, slow-developing scream. Then silence. Then another slow, tortured scream. It sounded like someone was twisting the neck of a small child, then releasing it …only to twist again moments later. We heard the scream maybe 10 times at close range. It seemed to come from the trees near a house next door. “Is that a cat in heat?” asked Kim. No, said Jen, no normal cat could make that sound. We were all spending the night at Kim’s cottage in a tiny seaside village on Orr’s Island near Harpswell, Maine. Kim recently purchased the cottage, a fixer-upper on a beautiful cove, and planned to host an Easter brunch for friends and family the next day. As the screams continued, Kim handed me a large silver flashlight. I got a good beam out the window on a bare tree. Nothing. I flashed it down the lawn, where the grass disappears and a rocky ledge drops 15 feet to the water line. Something was there. A small four-legged animal dashed into the light, then disappeared along the rocks. Kim and I took the flashlight into the yard. We walked near the shoreline. A large fishing pier creaked in the water nearby. There was no moon. The warm early-spring day had turned into a chilly late-winter night. I ran the flashlight beam down the rocky ledge near the water and in front of a house next door. The tail lights of a parked car reflected back at us. We moved closer to the rocks. I shined the light into the darkness. Two white eyes stared back at us: They glowed like nuclear marbles. The animal was well hidden in the rocks. Then it moved. It moved like a cat…but it wasn’t a cat…it climbed the rocks and slowly moved into the brush above the rocks. The animal stopped near the parked car and looked back at us again. More glowing eyes. It was like we were shining deer… without a weapon. It was time to get back in the cottage. The next day Kim described the incident to an Easter guest. Curt, a bearded Green Bay Packer fan restoring a farm-house in rural Maine, answered immediately. 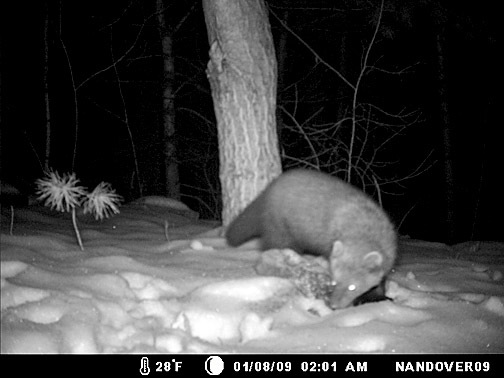 “Fisher Cat,” he said, in such a matter-of-fact way you knew he was right. There was a gasp from everyone else at the table. Everyone else chimed in: Fishers attack cats. Dogs aren’t safe. Watch your children. Don’t go near a Fisher. Run the other way. And don’t go outside with only a flashlight in your hand after you hear one scream. That was chilling. If I have nightmares tonight you will hear about it. Wow- scary! 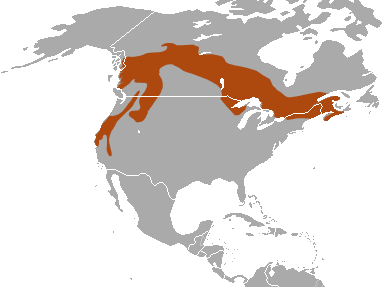 According to Wiki the Fisher cat is not a cat- but part of the weasel family. I wouldn’t want to run into one after seeing the pictures.